To prevent damage to the wiper blades, do not use gasoline, kerosene, paint thinner, or other solvents to clean them. 1. 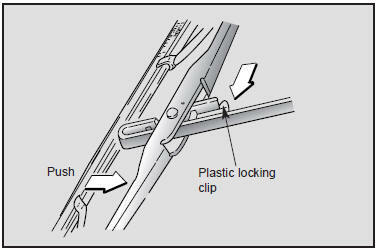 Raise the wiper arm and turn the wiper blade assembly to expose the plastic locking clip. Compress the clip and slide the blade assembly downward; then lift it off the arm. 2. 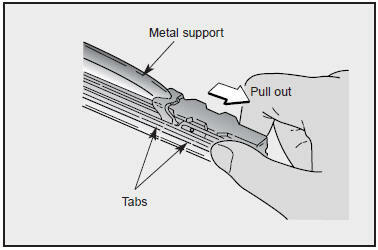 Firmly grasp the end of the rubber blade and pull until the tabs are free of the metal support. 3. 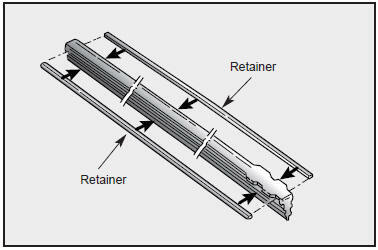 Remove the metal retainers from the rubber blade and install them in the new rubber blade. Do not bend the metal retainers. 4. Carefully insert a new rubber blade and install the blade assembly. 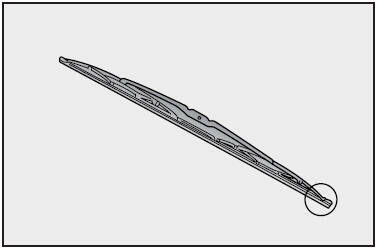 Install the blade with the tabs facing towards the bottom of the wiper arm.